So very cute! 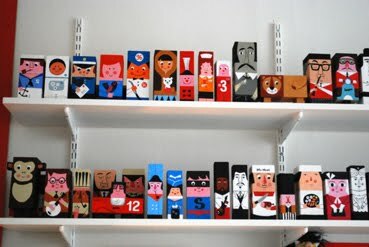 These would actually be a fun project to do yourself and be create all sorts of interesting characters. Charming indeed. I'm off to have a look at her blog. I'm totally stealing this idea for my kiddo. He'll be in heaven! Such a great idea and incredibly cute! These would be brilliant to do in school. So simple yet extremely effective. Love these. 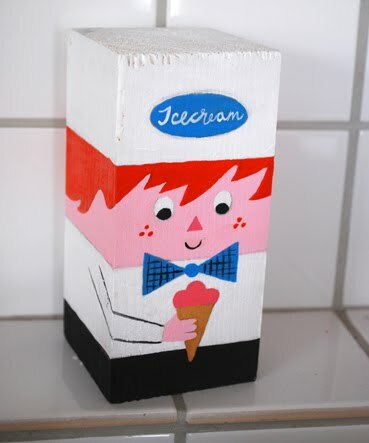 And I have a certain husband who has a barrel of woodblock scraps that are just dying to be turned into something like this! Oh my gosh, I NEED some of these. So cute! I wish I had the talent to create things like that - I really admire those who do! how lovely.wonderful.now ı m going to the blog to see all of them. Great find! I love these they're so cute and I love the style looks fab thanks for sharing. does anyone know if these are available to buy? Awesome!! What a wonderful idea for scraps and customizable presents. This is so fun!! What a great idea! What a great idea! 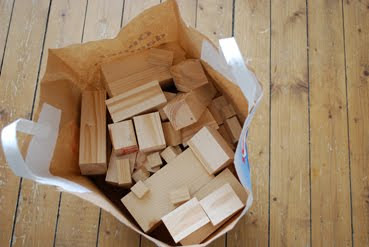 I have an entire bag of blocks just like those and I had no idea what to do with them. I love these. How much fun. I may have to purchase them for my grands. Thanks for sharing. I visit your blog often and really like your posts and comments. Thanks! I am astounded. Absolutely fantastic!